Is the autism epidemic a “mad child disease” linked to mercury? This lecture was presented by Boyd Haley, Ph.D. at the 22nd Annual Meeting of the Doctors for Disaster Preparedness held in San Diego, California; June 2004. The Greater Good (2011) looks behind the fear, hype and politics that polarize people into emotionally charged pro-vaccine or anti-vaccine camps with no room for middle ground. Filmmakers Leslie Manookian, Kendall Nelson and Chris Pilaro spent over five years researching and making the film, which follows three families personally affected by vaccination. The film also features interviews by experts from all sides of the issue. Mrs. Holly Riley is the mother of a fully recovered autistic child. Her son Quinn was diagnosed with Autism around the age of two and yet in a just a few short years, through the use of biomedical treatment and traditional autism therapies, he was able to come out of the Autism fog. Holly discusses also her experiences related to vaccination and autism. (Produced by Larry Cook, 2010-2011). The routine administration of vaccinations continues to be a subject of controversy in the United States, as well as throughout the world. Parents who want the best for their babies and children continue to be faced with decisions that they fear could harm their children if made incorrectly. The controversy over the potential harm of vaccinating, or of not vaccinating, will not be resolved to the satisfaction of all parties anytime soon, if ever. This brief report aims to offer some practical information to pediatricians and parents alike who want the best long-term health for their patients and children, regardless of their sentiments on the topic of vaccination in general. While there seems to be a great deal of controversy over how frequently a vaccination might result in a negative outcome, there is little controversy that at least some of the time vaccines do cause damage. The question that then emerges is whether something can be done to minimize, if not eliminate, the infliction of such damage, however infrequently it may occur. When vaccines do have side effects and adverse reactions, these outcomes are often categorized as resulting from allergic reactions or the result of a negative interaction with compromised immune systems. While either of these types of reactions can be avoided subsequently when there is a history of a bad reaction having occurred at least once in the past as a result of a vaccination, it is vital to try to avoid encountering a negative outcome from occurring the first time vaccines are administered. Due to the fact that all toxins, toxic effects, substantial allergic reactions, and induced immune compromise have the final common denominator of causing and/or resulting in the oxidation of vital biomolecules, the antioxidant vitamin C has proven to be the ultimate nonspecific antidote to whatever toxin or excess oxidative stress might be present. While there is also a great deal of dispute over the inherent toxicity of the antigens that many vaccines present to the immune systems of those vaccinated, there is no question, for example, that thimerosal, a mercury-containing preservative, is highly toxic when present in significant amounts. This then begs the question: Rather than argue whether there is an infinitesimal, minimal, moderate, or significant amount of toxicity associated with the amounts of thimerosal or other potentially toxic components presently being used in vaccines, why not just neutralize whatever toxicity is present as completely and definitively as possible? In addition to its general antitoxin properties (Levy, 2002), vitamin C has been demonstrated to be highly effective in neutralizing the toxic nature of mercury in all of its chemical forms. In animal studies, vitamin C can prevent the death of animals given otherwise fatal doses of mercury chloride (Mokranjac and Petrovic, 1964). Having vitamin C on board prior to mercury exposure was able to prevent the kidney damage the mercury otherwise typically caused (Carroll et al., 1965). Vitamin C also blocked the fatal effect of mercury cyanide (Vauthey, 1951). Even the very highly toxic organic forms of mercury have been shown to be effectively detoxified by vitamin C (Gage, 1975). By potential toxicity considerations alone, then, there would seem to be no good reason not to pre- and post-medicate an infant or child with some amount of vitamin C to minimize or block the toxicity that might significantly affect a few. However, there is another compelling reason to make vitamin C an integral part of any vaccination protocol: Vitamin C has been documented to augment the antibody response of the immune system (Prinz et al., 1977; Vallance, 1977; Prinz et al., 1980; Feigen et al., 1982; Li and Lovell, 1985; Amakye-Anim et al., 2000; Wu et al., 2000; Lauridsen and Jensen, 2005; Azad et al., 2007). As the goal of any vaccination is to stimulate a maximal antibody response to the antigens of the vaccine while causing minimal to no toxic damage to the most sensitive of vaccine recipients, there would appear to be no medically sound reason not to make vitamin C a part of all vaccination protocols. Except in individuals with established, significant renal insufficiency, vitamin C is arguably the safest of all nutrients that can be given, especially in the amounts discussed below. Unlike virtually all prescription drugs and some supplements, vitamin C has never been found to have any dosage level above which it can be expected to demonstrate any toxicity. Kalokerinos (1974) demonstrated repeatedly and quite conclusively that Aboriginal infants and children, a group with an unusually high death rate after vaccinations, were almost completely protected from this outcome by dosing them with vitamin C before and after vaccinations. The reason articulated for the high death rate was the exceptionally poor and near-scurvy-inducing (vitamin C-depleted) diet that was common in the Aboriginal culture. This also demonstrates that with the better nutrition in the United States and elsewhere in the world, the suggested doses of vitamin C should give an absolute protection against death (essentially a toxin-induced acute scurvy) and almost absolute protection against lesser toxic outcomes from any vaccinations administered. Certainly, there appears to be no logical reason not to give a nontoxic substance known to neutralize toxicity and stimulate antibody production, which is the whole point of vaccine administration. Practically speaking, then, how should the pediatrician or parent proceed? For optimal antibody stimulation and toxin protection, it would be best to dose for three to five days before the shot(s) and to continue for at least two to three days following the shot. When dealing with infants and very young children, administering a 1,000 mg dose of liposome-encapsulated vitamin C would be both easiest and best, as the gel-like nature of this form of vitamin C allows a ready mixture into yogurt or any other palatable food, and the complete proximal absorption of the liposomes would avoid any possible loose stools or other possible undesirable bowel effects. Vitamin C as sodium ascorbate powder will also work well. Infants under 10 pounds can take 500 mg daily in some fruit juice, while babies between 10 and 20 pounds could take anywhere from 500 mg to 1,000 mg total per day, in divided doses. Older children can take 1,000 mg daily per year of life (5,000 mg for a 5 year-old child, for example, in divided doses). If sodium must be avoided, calcium ascorbate is well-tolerated and, like sodium ascorbate, is non-acidic. Some but not all children’s chewable vitamins are made with calcium ascorbate. Be sure to read the label. Giving vitamin C in divided doses, all through the day, improves absorption and improves tolerance. As children get older, they can more easily handle the ascorbic acid form of vitamin C, especially if given with meals. For any child showing significant bowel sensitivity, either use liposome-encapsulated vitamin C, or the amount of regular vitamin C can just be appropriately decreased to an easily tolerated amount. Very similar considerations exist for older individuals receiving any of a number of vaccinations for preventing infection, such as the yearly flu shots. When there is really no urgency, and there rarely is, such individuals should supplement with vitamin C for several weeks before and several weeks after, if at all possible. Even taking a one-time dose of vitamin C in the dosage range suggested above directly before the injections can still have a significant toxin-neutralizing and antibody-stimulating effect. It’s just that an even better likelihood of having a positive outcome results from extending the pre- and post-dosing periods of time. High Dose Vitamin C Cures Swine Flu And Gets Suppressed! Dr. Thomas Levy was brought to New Zealand in the wake of the Alan Smith story on 60 minutes called “Living Proof: Vitamin C – Miracle Cure?”. Alan was deathly ill with swine flu and he was cured because of HDIVC (High Dose Intravenous Vitamin C) This video was shot, edited and uploaded by Vinny Eastwood. Thomas Levy, MD, JD is a board-certified cardiologist and admitted to the bar in Colorado and the District of Colombia. He is the author of several books on vitamin C as well as numerous articles. By way of disclaimer, he is a consultant to a company that sells a brand of liposome-encapsulated vitamin C.
Amakye-Anim J, Lin T, Hester P, et al. Ascorbic acid supplementation improved antibody response to infectious bursal disease vaccination in chickens. Poultry Science 2000; 79:680-688. Azad I, Dayal J, Poornima M, Ali S. Supra dietary levels of vitamins C and E enhance antibody production and immune memory in juvenile milkfish, Chanos chanos (Forsskal) to formalin-killed Vibrio vulnificus. Fish & Shellfish Immunology 2007; 23: 154-163. Carroll R, Kovacs K, Tapp E. Protection against mercuric chloride poisoning of the rat kidney. Arzneimittelforschung 1965; 15: 1361-1363. Feigen G, Smith B, Dix C, et al. Enhancement of antibody production and protection against systemic anaphylaxis by large doses of vitamin C. Research Communications in Chemical Pathology and Pharmacology 1982; 38: 313-333. Gage J. Mechanisms for the biodegradation of organic mercury compounds: the actions of ascorbate and of soluble proteins. Toxicology and Applied Pharmacology 1975; 32: 225-238. Kalokerinos A. Every Second Child. New Canaan, CT: Keats Publishing, 1974. Lauridsen C, Jensen S. Influence of supplementation of all-rac-alpha-tocopheryl acetate preweaning and vitamin C postweaning on alpha-tocopherol and immune responses in piglets. Journal of Animal Science 2005; 83: 1274-1286. Levy T. Curing the Incurable. Vitamin C, Infectious Diseases, and Toxins. Henderson, NV: MedFox Publishing, 2004. Li Y, Lovell R. Elevated levels of dietary ascorbic acid increase immune responses in channel catfish. The Journal of Nutrition 1985; 115: 123-131. Mokranjac M, Petrovic C. Vitamin C as an antidote in poisoning by fatal doses of mercury. Comptes Rendus Hebdomadaires des Seances de l’Academie des Sciences 1964; 258: 1341-1342. Prinz W, Bortz R, Bregin B, Hersch M. The effect of ascorbic acid supplementation on some parameters of the human immunological defence system. International Journal for Vitamin and Nutrition Research 1977; 47: 2248-257. Prinz W, Bloch J, Gilich G, Mitchell G. A systematic study of the effect of vitamin C supplementation on the humoral immune response in ascorbate-dependent mammals. I. The antibody response to sheep red blood cells (a T-dependent antigen) in guinea pigs. International Journal for Vitamin and Nutrition Research 1980; 50: 294-300. Vallance S. Relationships between ascorbic acid and serum proteins of the immune system. British Medical Journal 1977; 2: 437-438. Vauthey M. Protective effect of vitamin C against poisons. Praxis (Bern) 1951; 40: 284-286. Wu C, Dorairajan T, Lin T. Effect of ascorbic acid supplementation on the immune response of chickens vaccinated and challenged with infectious bursal disease virus. Veterinary Immunology and Immunopathology 2000; 74: 145-152. Centers for Disease Control and Prevention (CDC) officials claim vaccines are safe and effective. Is that true? If vaccines are safe, why did the incidence of autism increase from one case of autism in 10,000 American children to one case of autism in 150 American children after the massive childhood vaccination program began? If childhood vaccines are safe, why are 560,000 vaccinated children afflicted with autism while nonvaccinated Amish and Mennonite children rarely have the disease? Why has the incidence of asthma, allergies, autoimmune disease, Type I diabetes, and neurologic conditions dramatically increased in vaccinated children? Why do obstetricians give pregnant women influenza vaccines that contain a toxic dose of mercury? Why do newborn children receive Hepatitis B vaccine in the nursery when there is no medical justification for the immunization? 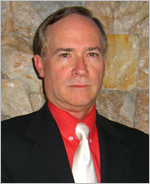 Dr. Russell Blaylock (born 1945) is a board certified neurosurgeon, author and lecturer. He is a former clinical assistant professor of neurosurgery at the University of Mississippi Medical Center and is currently a visiting professor in the biology department at Belhaven College. His discussion addresses those, and many other, issues. If you are concerned about your health, and the health of your family, you must watch this video. This lecture was given in October 2008 at the Radio Liberty Seminar. To summarize in broad terms, instead of resulting in prophylaxis, meaning prevention, all responses to vaccines actually fall under the broad umbrella of anaphylaxis, which means sensitisation, the OPPOSITE of immunization. In this extremely informative video (1998), fifteen people, including Dr. Viera Scheibner (a PhD researcher), five medical doctors, other researchers, reveal what is really going on in relation to illness and vaccines. Ironically, the important facts come from the orthodox medicine’s own peer-reviewed research. The video presents well documented answers to questions like: Was it really vaccines that saved us? Why are they only counterproductive? How are many statistics misleading? What do vaccines contain? What are they doing to our organs, immune systems, even our genes? Are childhood diseases really dangerous to healthy children? Why does vaccination continue? What are our rights? Can vaccine damage be evaluated and countered? What is the true key to immunity? Charlie Crist, the Governor of Florida alarmed at the growing rate of Autism and its effect on the children and families of the State of Florida as well as the economic impact on healthcare and educational systems, commissioned by Executive Order 08-36 (March 7, 2008) the Autism Task Force, a broad Panel of individuals from both private and public sectors, to examine and evaluate the risks to the children and economy of the State of Florida. On September 24-25, 2008 Governor Crist’s Task Force on Autism Spectrum Disorders convened at the University of South Florida in Tampa, Florida. These are highlights from the two day conference. The use of thimerosal (ethylmercury), a preservative used in vaccinations, was the hot topic of the two day conference. Mercury and its compounds are hazardous to humans. Ethylmercury, mercury’s most dangerous compound, is used extensively in vaccines as a preservative and anti-bacterial agent. Dr. Russell L. Blaylock (born 1945) is a board certified neurosurgeon, author and lecturer. He is a former clinical assistant professor of neurosurgery at the University of Mississippi Medical Center and is currently a visiting professor in the biology department at Belhaven College. The autism spectrum disorders (ASD) are a group of related neurodevelopmental disorders that have been increasing in incidence since the 1980s. Despite a considerable amount of data being collected from cases, a central mechanism has not been offered. A careful review of ASD cases discloses a number of events that adhere to an immunoexcitotoxic mechanism. This mechanism explains the link between excessive vaccination, use of aluminium and ethylmercury as vaccine adjuvants, food allergies, gut dysbiosis, and abnormal formation of the developing brain. “We have a fairly large practice. We have about 30,000 or 35,000 children that we’ve taken care of over the years, and I don’t think we have a single case of autism in children delivered by us who never received vaccines,” said Dr. Mayer Eisenstein (2009), Homefirst’s medical director who founded the practice in 1973. Homefirst doctors have delivered more than 15,000 babies at home, and thousands of them have never been vaccinated. 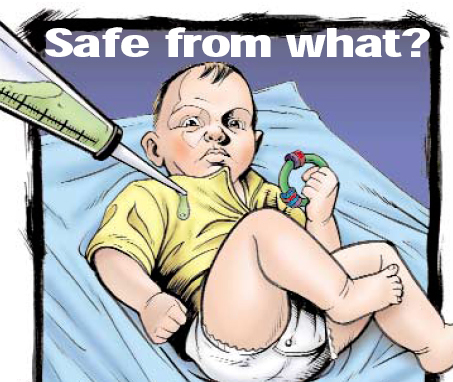 In the United States, the number of mandatory vaccine injections has risen to 36 per child. Each of these injections contains neurotoxins such as aluminum, formaldehyde, aborted fetal tissue, animal by-products, heavy metals, and many others. What happens to a child’s fragile immune system when it’s overloaded with these toxins? From the award-winning director of The Drugging of our Children, Gulf War Syndrome: Killing Our Own and AIDS Inc. – comes the latest film of critical social importance: Vaccine Nation (2008). For most people, vaccinating themselves and their children seems like a good idea. Vaccines are safe, effective and are supposed to protect us against dangerous infectious diseases – Right? Wrong! What you don’t know can harm you or kill you! In this groundbreaking film, you will: See the truth about the dangers of vaccines and their direct relationship to autoimmune diseases, infections, allergies and a massive increase of developmental learning and behavioral disorders in children, such as Autism. Discover the truth about the history of vaccines and how they have NEVER been proven to be safe and effective for anyone. Witness the legacy of governmental deception and cover-ups associated with vaccines. Learn about the corruption within the scientific community and how vaccine studies are seriously flawed. 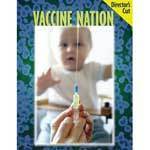 You’ll also follow heart-wrenching, real life stories of the parents and children devastated by the effects of vaccines. 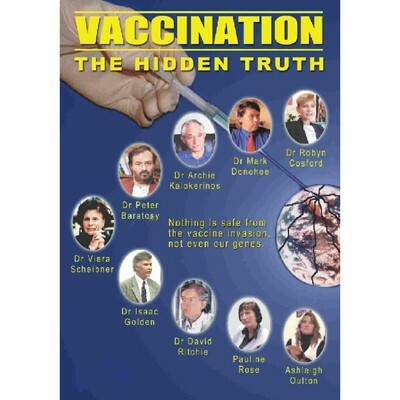 Join director Gary Null PhD and over 40 of the worlds foremost vaccine experts in this shocking expose’ that will shatter the truth as you know it.